Christmas gifts for the home can be some of the best types of Christmas gifts ever. Whether you choose something that is practical that will be used from day to day, or you purchase something that is collectible that can be displayed in your loved one’s home, these types of Christmas gifts are things that will be treasured for years to come, not simply put away in a closet somewhere. While it is true that you could head on over to your local department store or home improvement store to find Christmas gifts for the home, most of the items that these stores carry are common items, not the one of a kind gifts that make a home special. Fortunately, you won’t need to go dashing through the snow, slip sliding on the ice, warming up your sleigh, or hassling with the crowds and long checkout lines downtown to find the best Christmas gifts for the home. We have some great ideas for unique gifts right here! Help your loved ones hold the door open for all of their holiday guests with these unique door stoppers this holiday season. 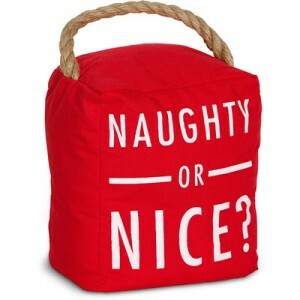 The Naughty or Nice door stopper will bring loads of holiday cheer to your loved one’s entryway, and the Love Lives Here door stopper will bring heartfelt thoughts and inspiration to your loved one’s home throughout the year. 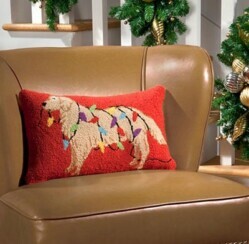 This Retriever with Ornaments Decorative Throw Pillow will bring loved ones memories of those unique pillows the Grandma used to make this holiday season. Pair it with a colorful throw, a holiday movie and a bottle of your loved one’s favorite wine to suggest a cozy movie night. Check out this Calm Breeze Jar of Notes to add a refreshing touch to your loved one’s display case or end table. Filled with 31 personal messages, this unique gift will delight that special person throughout the year. 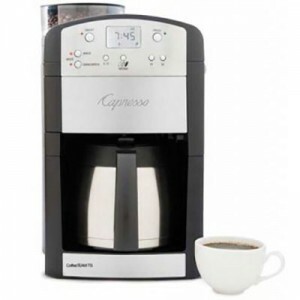 Your loved ones will love waking up to a magnificent cup of freshly ground coffee when you order the Capresso Coffee Team this holiday season. A built in grinding system sets this impressive machine apart from the rest. Don’t forget to add a festive touch to your loved one’s outdoor décor this holiday season! These Peppermint Christmas Pathway Lights will light the way to a magnificent Shimmering Nativity Set that is sure to bring joy and remind your favorite family of the true reason for the season. One of our most heartwarming Christmas gifts for the home, this elegant Live, Love, Hope Angel Figurine is sure to bring peace and blessings to your loved one’s favorite curio cabinet or display shelf this Christmas and throughout the year. What unique ideas for Christmas gifts for the home can you think of? Do you enjoy receiving gifts for your home during the holidays?